The annual ABC Outdoor Extravaganza is hosted by the Southeast Texas Chapter of the Associated Builders and Contractors (ABC). The event is becoming increasingly popular especially for its networking opportunities. The event features an outstanding exhibition, where United Safety will once again be present. At our booth you will have the opportunity to see one of our latest innovations: the Air TreQ™ Blinder. Launched this year at AFPM Reliability & Maintenance conference with incredible success, the Blinder is already deployed in the industry, and it is currently helping to increase overall efficiency and productivity of turnarounds across Texas. 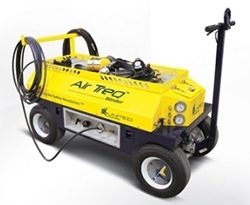 The Air TreQ™ Blindercombines breathing air delivery and pneumatic power source in a small, mobile package, making short-duration tasks such as blinding more efficient.